July 2008 – Phsew! 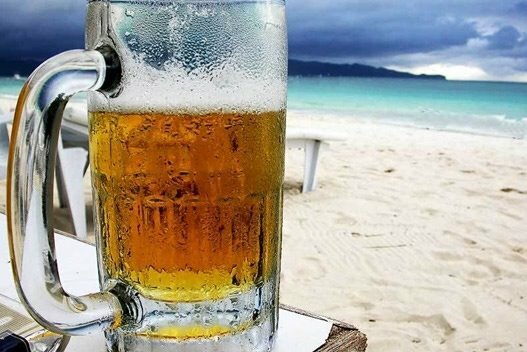 You all may be saying the same thing after you read this lengthy report, but it covers 10 glorious days in paradise. I apologize in advance for possibly too many details, or for not doing it in parts, but grab a beer, pull up a sit and hope you enjoy it! Where to begin? I wish that I would have done a daily journal as my “new” 50 year old brain is not as sharp in memory retention as it once was. This was our third trip to Quintana Roo and we would have never in our wildest dreams imagined having our very own little piece of paradise! It was Akumal that really touched our hearts on our first trip and now how wonderful to have found the neighboring town of Chemuyil to become our home away from home. We arrived in Cancun at 4:45pm, went through customs with 4 very large suitcases that were all 50 lbs. give or take some ounces. The lines went very quickly and we got the green light – GO! Onto Easyway for our car rental which was also fairly quick and they even gave us each a cold mini Sol while we did the paperwork. Great service, great car for our purposes…..we were delighted they gave us a VW station wagon as we were only expecting the basis economy car. Do check them out! After months of anticipation and waiting we were on our way to one of the greatest adventures of our lives! The traffic in Playa is brutal nowadays and that took awhile to get through at that time of evening. We arrived at Jeri and Steve Sayers a bit late for the 4th of July BBQ and we felt so welcomed being able to meet many wonderful neighbors. We had just missed Nolan and Farrah from B.C., our Canadian neighbors to the north of us……..and I’m sure we missed others those last couple of days as we saw new faces driving past our casita waving. It was energizing to see how busy everyone was! We got our keys from Rob after Jeri had made numerous attempts to get them during the week. We’re very glad Rob was there! We opened the front door to our casa and we were pleasantly surprised to see it sparkling clean and so bright looking! 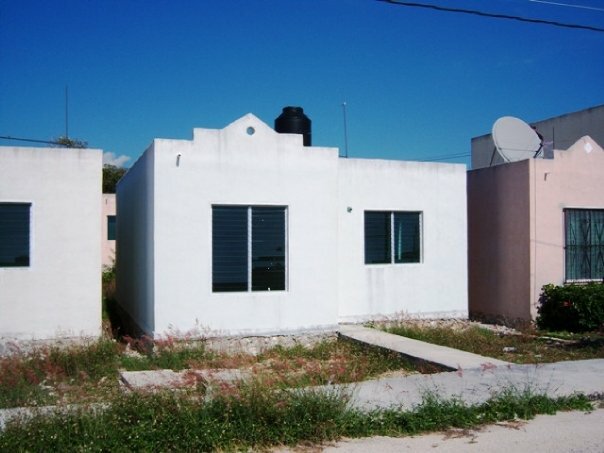 We had originally seen one of the houses on our own that was sitting wide open last fall as Bill and Rob were away in Chetumal getting everything set with IPAE. Thank you Claudia & team for having the house in such lovely condition for our arrival! Although we were running on only 3 hours of sleep and had been up since 3am Seattle time, we were so jazzed to finally be here! I had to almost pinch myself. We blew up our aerobed and pulled out our novels that were hard to focus on as we continued to talk about what the next day’s plans were. Sleep came and so did morning! Here’s a picture of our casa in the beginning……. We woke early and checkout out our new place well, now that it was daylight. It was 7:45am, Saturday and we were on the road again. We stopped at the Turtle Bay Café in Akumal for a hearty breakfast that would last the day. This is a great spot to have a bite to eat and with decent prices……and free wi-fi. Back up to Cancun to Costco as we wanted to check out pricing on mattresses and see what they had in the way of other furniture, patio furniture, etc. We ended up buying a large cooler, a couple of beach chairs and a supply of liquor to bring back home to the states. Next stop the glass factory and bought a beautiful set of 6 blue rimmed glasses and matching pitcher with a sailboat and palm trees etched into them for $300 pesos. We then went into the Teak Factory, Caribbean Home and a couple of other muebles (furniture) stores in the strip mall next door. Got some ideas but since we had just begun and weren’t familiar with pricing yet we decided to keep looking. Ended up next at the old Telebodega (which I wouldn’t recommend) as it was a very hot store with no A/C. Left there after a brief run through. By this time we were getting hungry again as it was around 3pm. We no sooner pulled out of the parking lot and there was El Oasis right next door. We’d wanted to go here on previous trips but never did find it. Great tacos and salsas! We each had 2 tacos and a beer. It was a really nice atmosphere even if it is on the highway and they have really cute young waiters. Next stop – the new humongous Telebodega store! We probably spent close to 2.5 hours in there looking at appliances, furniture and mattresses. They have great prices and a good selection. The stove and refrigerator we wanted had to come from Cancun and they were to be delivered on Monday. We did end up with ceiling fans and a microwave, so at least we could heat up water for our French coffee press that we brought with us as a temporary café station. Oh, and we got a nice blender too! It’s stainless and was $53. We found overall that small appliances and electronics are more expensive in Mexico. Last stop Soriana for some housewares…..after browsing through City Club and Coppel. We bought cleaning supplies, dishes and a few grocery items. The mall is nice with internet access in the food court and at the Italian Coffee Company and lots of A/C, so it’s a great place to escape the heat of the day, too. By the time we arrived back home to Chan Chemuyil it was after 6pm. After unpacking everything, we went into the pueblo and ate at Leo’s ordering up a couple of beers and the pizza with langosta and camarones – delicioso! What a busy and very productive first day. Sunday we had a leisurely morning around the casa and went for a walk around the “hood” to see all the activity and check out the cenotes. We ran into Maggie packing it in to go back home – she was so sad to have to leave this very special place. We chatted a bit and hugged. We headed back to the casa afterwards, thinking about how we’d feel a week later when it would be time for us to leave. We decided to take a drive into Tulum and picked up a few housewares at a little abbarotes tienda, found a number 5 Talavera tile to hang for our address and picked up a roasted chicken at a place on the West side of the highway and ate it curbside with a cold beer. We decided to take a drive out towards Coba to see what artisans and craftsmen we’d find. Some places were closed since it was Sunday and there was not many people traveling the road. We were on the hunt for furniture and we came across a place in Francisco Huy that is right next to a mini-super and the store was being minded by a young Mayan boy about 8 years old. Although it was difficult to communicate we really had fun trying and using our translator and learning. Everyone we met was always so patient with our clumsiness and effort of trying. They had beautiful things there – armoires, tables, chairs and some great prices. 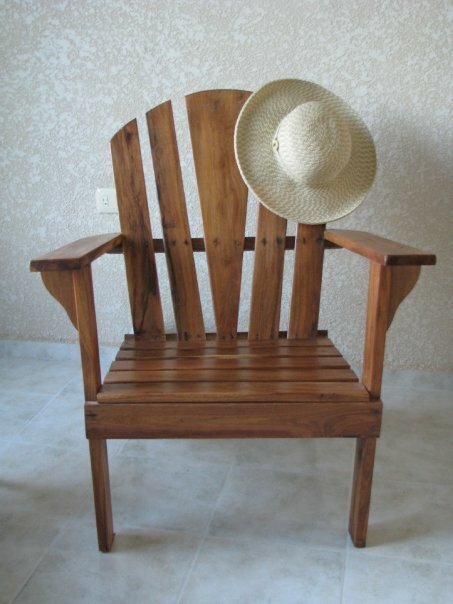 We got a lovely Adirondack chair for $600 pesos. We checked out a nursery in Macario Gomez, but weren’t ready for plants on this trip. Back home we unloaded our small shopping spree and headed to the beach at Xcacel for the rest of the afternoon. Splashing and jumping in the waves never felt so amazing. It was good to be back at this lovely beach we first came upon last fall. To think that this is our neighborhood beach was such a good feeling. How lucky we are! The water must have been 85 degrees. And then we got some showers that actually felt really wonderful. We saw Carol and her son Wes and hung out with them for awhile. We chatted about our plans for our casas and enjoyed getting to know one another. 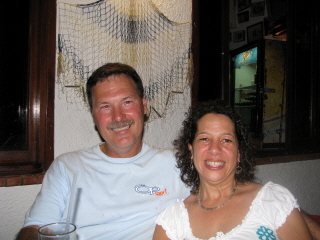 We ended up making dinner plans with them and going to eat at La Cueva del Pescador in Akumal. This was a favorite for us as we’d eaten there on our last night during the previous fall visit. I had the Arracherra (melts in your mouth!) and Mark had the grouper. We had a couple of margaritas and left there very satisfied! Our bill for the 4 of us was a mere $640 pesos. Another peaceful sleep in our new casa. Monday we got up as usual between 6 and 6:30am. We needed to run some errands and be back for the appliances to be delivered by Telebodega between noon and 6pm. Headed into Tulum again to Boxito (pronounced Ba-shee-to) in search of a ladder and a mirror. Found great prices on both. The combination ladder (step to 7ft. high/extension to 12ft.) was unusual as we hadn’t seen one of these in the states. Cost = $810 pesos. We later saw the same ladder at WalMart for $1021 pesos. The mirror is an arched shape with lovely etching and was only $280 pesos. Mark drew up plans for our closet organizer. We stopped in town and in my Spanglish, we asked two women taxi drivers where we could find wood. She gave us directions and we figured out that it was at the south end of town. We spoke with a Mayan man at the Madereria Cahuacan in our both of our own languages what we needed and agreed to pick it up later. Mark returned in the afternoon with that handy VW station wagon – what a great car! Meanwhile back at the casa, my handyman decided to hang up the ceiling fans and although it wasn’t difficult for him, he said that paying someone to install them is well worth the money if you don’t have the proper tools. Next we wanted to install our lovely bathroom fixtures that we brought from home. They are a charcoal colored wrought iron with a simple floral motif. He was removing one of the old porcelain towel hooks on the wall next to the sink and it promptly fell off and hit the sink, cracking it! Well, that new sink we’re wanting is going to be installed sooner than we’d thought. Pretty darn handy, eh? The rest of the job went well and we did a bit more nesting around the house for the rest of the evening. The appliances never made it, so we had to get more ice for the cooler. Mark went over to the pueblo for ice, beer and picked up the “Mexican” pizza from Leo’s for dinner. We had another restful night (as restful as one can be on an aerobed) in our casa. Tuesday, July 8th and I am officially 50 years old! I know some people don’t like sharing their age, but I am happy to be where I’m at right now. Beats the hell out of the alternative! So, the one thing I didn’t want to do on my birthday was go shopping but you can’t always get what you want, so a shopping we will go. PDC was hectic and busy as usual, but I did find my first item for hanging on the wall, a beautiful handpainted crucifix. We were also looking for lamps, but nada. We finally found Rumbo Deco, (which is just south of Juarez y 30th) and their furniture is beautiful! Severin was in Switzerland (?) but we met her wonderful husband. We are going to order the futon sofa sleeper soon so that it’s there when we arrive in October. The wood and finish work is beautiful! It was really pouring down rain in Playa and as we headed back south to Chemuyil, the skies cleared again. We freshened up and headed over to the Lol-Ha to meet up with all of our great neighbors for a birthday celebration. We had so me drinks and appetizers and then headed to La Cueva del Pescador for more drinks (damn those margaritas are something else!) and a wonderful dinner. I had the lobster and as usual it was muy delicioso!!! The food and the service there are really great! A fun evening was had by all……even the teenagers, who had their own table next to ours. What great kids! It’s nice to see them getting to know each other and hanging out too! Next morning we had fuzzy heads from the margaritas, so Mark decides he needs to “work it out” and sweat the impurities from his body. He got to work on the wood we picked up for the closet organizer. I assisted his efforts for awhile as his go-fer and then headed off to the beach in Akumal to rest in the sun and the sea washing away the effects of the night before that were still somewhat lingering. Oops, but how to get there? In the name of safety we left the car at the Lol-Ha the night before and took a cab home. I walked out to the highway to catch the collective or cab and instead along came Sergio and Hilary! The beach was a good place to be as so many folks were there that afternoon – Jeri and Steve and the kids on their last day, Vicki and Curtis and their kids – and then Carol and her son, Wes came a bit later. I swam with my first turtle in Akumal Bay that day so I was a very happy woman! When I arrived home (dontcha’ just love it!) Mark had made some good progress and finally our appliances had arrived! We were both pretty exhausted and decided to run into Tulum and grab some dinner at Charlie’s and check email at the Internet café. We were back at the casa and in bed by 9:30pm. Another peaceful, dreamy sleep. Thursday morning I went over to the pueblo and went to Pastor Gambor’s Panaderia (Bakery). What a nice man and he sells a nice assortment of fresh and muy delicioso pastries and breads! Do check it out! I also went to pick up some laundry we had done for a mere $40 pesos. If you have delicates or things that you really cherish, I would probably wash those by hand and hang dry. Our appointment with the Notario in Cancun wasn’t until 5pm but we wanted to leave early enough so we didn’t have to stress out about time. We followed Claudia’s instructions and parked at the Las Americas Mall and took a taxi from there. Good thing – you think the traffic is bad in Playa. It was nice to relax and take in the scenery of this bustling city. We arrived quite early and talked with a taxi driver who spoke great English – we must have looked a little lost to him – and he told us where we could get some good eats. From the Notario’s office – head east to the corner and walk 3 blocks north. Turn left and in the middle of the block you will find a small seafood restaurant that was actually quite good and our bill for lunch was $55 pesos!!! We each had the special and had already two soft drinks we’d purchased at the corner store. We got back to the Notario’s office which is beautiful and air conditioned, so we were feeling relaxed by this time, when in walk some gringos – I knew they had to be from Chan Chemuyil. It was Bruce and Sandy who we met for the first time. Very nice people……sorry we couldn’t make it to their open house on Sunday as we were leaving. Look forward to meeting them again next trip hopefully. Everything went quick and easy at the Notario’s office and then we headed off to Home Depot for more supplies and to shop for lamps……still nothing in the lamp department. We got back to the casa around 9pm and went straight to bed as we were pooped! 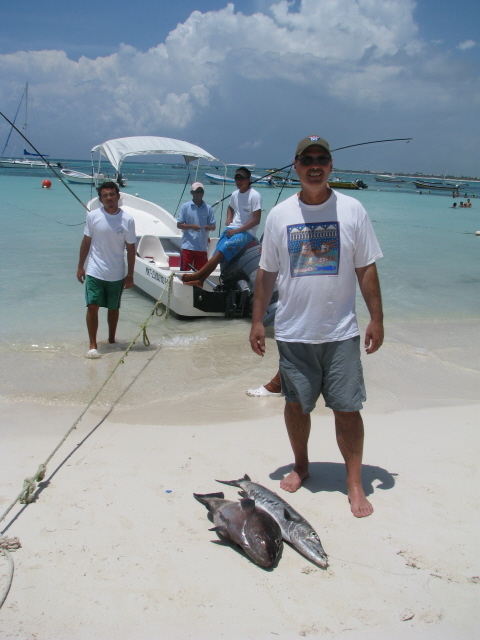 Friday morning we were up and out the door to Akumal Bay for our fishing trip! Two young pescadores that work at La Cueva took us out for a 3 and half hour trip in a partially covered panga boat. We weren’t out for 10 minutes before Marked hooked a 3 foot long barracuda. They troll a lot faster for fish there than we do up north here for salmon. We were thrilled to see big sea turtles up close and out in the sea swimming along. It was also great to see our beach from a boat. When you get past the Bahia Principe and starting at Chemuyil Bay, the beach becomes very secluded and you no longer see resorts and condos……it’s really quite peaceful. Just after we passed Xcacel Beach Mark hooked a grouper. That fish must have weighed 35 lbs. It was huge! After all that the guys asked if we were ready to snorkel. We stopped at a reef just off Tankah Bay and snorkeled for about 30 minutes. It was really nice, saw lots of fish and it felt so good to cool off! We hopped back in the boat and trolled back up to Akumal Bay losing an even larger barracuda on the way. Well, it was a great trip and we’d definitely do it again. It was nice to be out on a boat, that was a first for us in this part of Mexico. When we got back everyone was checking out the “catch of the day” and Carlos from La Cueva wanted to know what time we’d be back for dinner. We went back to the casa, did a few things and got cleaned up for dinner. We ran into Kathi and invited her to join us for dinner and Carol and Wes stopped by too and we asked them to come along as well. Our grouper was prepared in 3 different ways – grilled in butter, grilled in garlic sauce and also a curry sauce. Muy delicioso! The bill was for $220 pesos for the 5 of us – charge was for the drinks only. I was going to get Mark an award of a La Cueva del Pescador T-shirt but they only had mediums. Hopefully when we return in October they’ll have his size. He’s got to have one to go along with his fish stories. Saturday we met with Joe and Renee in Playa to pick out a the bathroom sink (thank you Mark for the breaking the old one). They are such wonderful people to take the time out of their very busy schedules of getting homes ready for everyone! This place is awesome and the prices can’t be beat. We bought our new sink and light cover for the front porch for $620 pesos! On the way back Chemuyil we stopped to have lunch at Lucy’s Kitchen – great shrimp tacos and black bean tostadas! Darn, no room for ice cream! Today was particularly hot and humid so we decided to head off to Xcacel for awhile. The water was perfect and it was late in the day so it was much quieter here than the Sunday before. As we were leaving we met Glenn Walker and his daughter Laura at the beach……if there were only enough time to visit with everyone. His wife and other children were at home taking a siesta so we hope to meet them next time. We decided to check out the buildings where the turtle camp was taking place. We met a very nice young woman from Mexico City, Antionette, who spoke English quite well and she told us we could come back in the evening around 8:30pm for the official Turtle Walk. We went home, showered and Mark started putzing around the casa and I went over to the pueblo to get dinner. Ended up at Leo’s again and got chicken fajitas for me and arracherra for Mark. I met Dawn and Terry Thimesch who had just arrived the night before and were having dinner. When you see a couple of gringos in town at that time of evening it’s easy for us to assume they must be some of the new neighbors. We chatted a bit and it was so nice meeting both of them! I had gone over to the store and picked up a six pack of Sol to go with dinner and saw Glenn and Laura again…..and we said another quick “hola”. After dinner….and to the beloved turtle sanctuary beach, Xcacel. OMG! This was one of the most incredible adventures I’ve had so far and right on “our very own beach”! There was a group of about 8 young folks (backpackers I’m assuming) from Europe who were staying in Tulum and another couple a bit younger than us. We walked along the beach under the moonlight – no flashlights needed – and our first encounter with the turtles was with about 100 baby loggerheads that had just hatched. They were so cute and so lively. Much later in the evening they would be released into the sea. About another half mile down the beach we hit the jackpot! There was a green turtle laying her eggs. One by one the eggs dropped, sometimes dropping quickly in 3 or 4 in succession into this perfectly shaped hole that the turtle digs. Once the turtles are in their trance-like state of laying eggs nothing else matters. We were gathered around her quite closely and kept very quite whispers. A small flashlight was placed so that you could view her laying the eggs – over 100 per night and she will do this for 4 or 5 nights in a season. You could only take pictures if you weren’t using a flash. I hadn’t had time nor could I figure out how my new camera worked in the dark w/o flash, but the couple we were with took pictures and she will email them to me soon hopefully. They also are interested in renting our casita! Nice people from San Luis Obispo, California. Anyway, we never imagined that this turtle walk would be a for sure deal – it was the most incredible thing I think I’ve ever seen in my life, besides of course the birth of my children. It was such a peaceful and wonderful way to spend our last evening in Chemuyil. Just another example of how lucky we all are to have a little piece of paradise here! Sunday morning our last morning in Chan Chemuyil and we were sad that the time had come to go home already. Those 9 days and nights went much too fast! But, with that realization comes the wonderful feeling of knowing that we get to come back again and again. We pack up, leaving lighter than we came and head off to the airport. We realize we hadn’t eaten breakfast and it was now lunchtime, so we decided to stop at the Lol-Ha and have lunch. Well, who do we run into again but Carol and Wes. We had a craving for hamburgers and my, did the Lol-Ha burger ever satisfy me for the rest of day. I also finally got to try those mango margaritas that I’ve heard so much about from Jen. Yummmy! We enjoyed our last visit at the beach and headed to the airport. Again, everything went smoothly and we hung out until boarding time. It was such a good feeling to think about how pretty seamless our plans and our trip went. While we didn’t get everything done we wanted to, we can add them to the list for next time. Like Carol said, it is so cool to just run into neighbors all around “the hood”, in the pueblo, at the beach and the stores. It was yet another special feeling knowing how blessed we are to find such an amazing place to call our home away from home. So, to all of you who we met……..Jeri, Steve, the Sayer kids, Joe & Renee, Shelly G., Kathi Knedlhans, Maggie aka Kat, Vicki and Curtis and their kids, Carol and son, Wes, Paige’s mom Gayle, her next door neighbor and friend Barb, Claudia, Rob, Bill and his adorable girlfriend Anna, and Bill’s son Chaz and his cute little girlfriend, Steve and Paula from Xcalak, Allen and April Gordon (they have the house with the cool looking shutters), Bruce O’Connell and Sandy Trujillo briefly at the notario, and Mimi and Lowell briefly at the Sayer’s party – Cheers! Here’s to an incredible group of people that make up the very special Chan Chemuyil! Thanks again to the BG Realty team for helping us make this happen! We love our house and look forward to the October meeting to work together on making this one of the best communities in the Mayan Riviera! If I missed anyone, please forgive my incontinent memory. Sorry for rambling on, but it is SO nice to relive the memories…..and now back to packing again for the next trip!